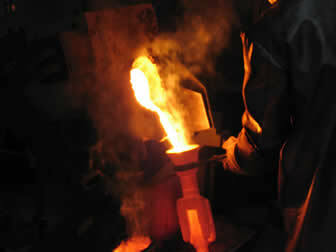 Established in 1975, the foundry has grown to be one of Europe's most prominent medium sized producers of investment castings by means of the 'lost wax process'. It has, over the years, managed to acquire a position where it is capable of supplying high quality castings at affordable prices. Mainly due to a high degree of flexibility and ever increasing automation, are we capable of meeting the demands of various manufacturing industries. The innovative approach to engineering the right casting for the required application, results in the ability to meet the highest standards, yet aiming for a cost-effective solution for the customers' needs. The quality assurance system based on ISO 9002, assures a constant quality throughout all production stages. We supply castings in all alloys from non-ferrous to stainless and full duplex steel, Stellite, Inconel, Monel and Hastelloy, to a variety of industries, ranging from electronics, dairy- and foodprocessing, defense-technology, maritime- and chemical industry as well as aircraft builders. These castings can be supplied with additional machining if required, surface- and /or heat treatments, by either inhouse facilities or by our reliable subcontracters. Due to the flexible organization it’s possible to produce small and medium series. It is even possible to produce just a few prototypes. Our engineers can help you reduce costs and produce a better product. Ask us for the possibilities! To produce very small quantities without the tools normally needed we use Rapid Prototyping. This is a quick and easy way to manufacture your product in the right metal. Small production series can also be made this way.